Adjustable 316L steel bracelet in silver shade, pendants - flat and 3D heart, chain of oval rings. Steel bracelet is made in silver shade and consists of larger oval rings. 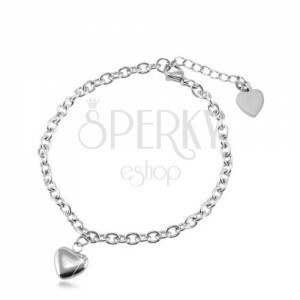 In the middle of the bracelet is gripped a shiny rounded heart. The second, smaller heart is placed on the last ring of the extra chain. The bracelet has a lobster clasp.